Having just returned home after being away for nearly three months we were alarmed at the taste of our tap water - it seems our old filter which had served us very well was on its last legs and we were in need of a new under-the-sink water filter system. Knowing how important our water intake is to our general health and wellbeing, I set out to do some research and to find a suitable filter within our limited budget. A few phone calls, research on the net and a couple of visits to suppliers and I settled on the American Made Techno-Twin-Water-Filter. The Techno-Twin Water Filter was available very close to home, is super compact, uses the latest technology available and offers many advantages over other economy systems. 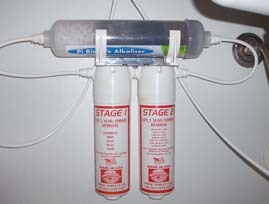 Stage 1 Filter will remove sediment, dirt, dust, rust and sand. Stage 2 Filter will then remove greater than 99% of chlorine, colour, taste, odour, the bacteria Giardia & Cryptosporidium and greater then 97% of lead and heavy metals. These 2 techno-twin filters, the pre-filter which removes sediment and the high-grade carbon filter, need to be replaced every 12 months. This is very easy as it is just a matter of unscrewing the used filters and adding the new ones - nothing to clean or sanitize - the techno-twin filters are complete in themselves. The Techno-Twin-water-filter is very easy to install and all plumbing fittings and standard faucet are supplied. There is a choice of faucets if you prefer something other than the basic one that is supplied. For your Techno-Twin-Water-Filter just contact Byron or Grace at WaterFilterWorld to buy online, and if you live in Australia, your Techno-Water-Filter with Pi Bio Life Alkaliser attached, will be delivered to your door with just a tiny $10 delivery charge. I am certain they will give you a great deal, as they did for me ... don't forget to tell them you read about it on wellness-decisions.com ....PS: I don't benefit financially from your recommendation but nice if they know. Here is our Techno-Twin-Water-Filter installed under the sink, complete with the added Pi Bio Life Alkaliser. This turns our water filter system into life enhancing 'living water' - it's the perfect companion to all drinking water filtration systems. The research by Doctors Yamashita and Makino also found that when trace amounts of ferric/ferrous (iron) salt were energised in the water, the energy of the water increased dramatically. During 30 years of research, Pi Water's life giving energy has been shown to stimulate the self healing properties of the cells of plants and animals alike. It was this process that created what is now referred to as "Pi Water" or "Living Water". It's called 'The pH Miracle'. Dr Robert Atkins is quoted as saying:"Just about every condition I can think of, from arthritis to diabetes to cancer, is associated with acidity". 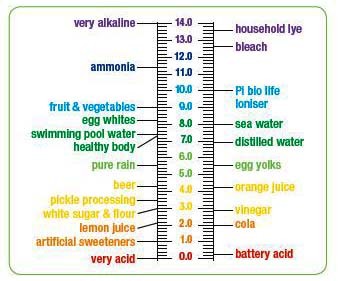 Naturopathic physicians believe that at least some 157 diseases are caused by an abnormally acidic/low pH system. In fact, almost every named and unnamed disease condition has one thing in common:...higher than normal accumulation of acidic waste in the body. When your tap water arrives at your home, it will usually be a little over neutral in pH ~ around 7.5. You can see by the table that a very large proportion of what we consume is acidic; the perfect balance is 1 part acidic to 4 parts alkaline. This becomes very easy with the Pi Bio Life Alkaliser. Your body doesn’t have to use all its energy trying to neutralise its pH. You already know the benefits of having clean, filtered water. The Pi Bio Life Alkaliser can provide you with the earth’s greatest resource for your personal health and peace of mind. The Pi Bio Life Alkaliser will provide enhanced or 'living' water that is energised and has one of the best absorption rates in the world. Just as the accumulation of acid wastes has an aging effect, the reduction of acid wastes helps to reverse aging. A healthy non acidic body is at it’s ideal weight. Acids bind to the fat cells. Some fat cells are voided from the system, but many fat cells are stored in the body, resulting in weight gain. Once fat cells are no longer needed, the body will eliminate them - the fat melts away and the body will return to its natural ideal weight.